Since its initial release in 2007, the iPlayer has become an increasing success, bringing television and radio services via the internet to millions of people. 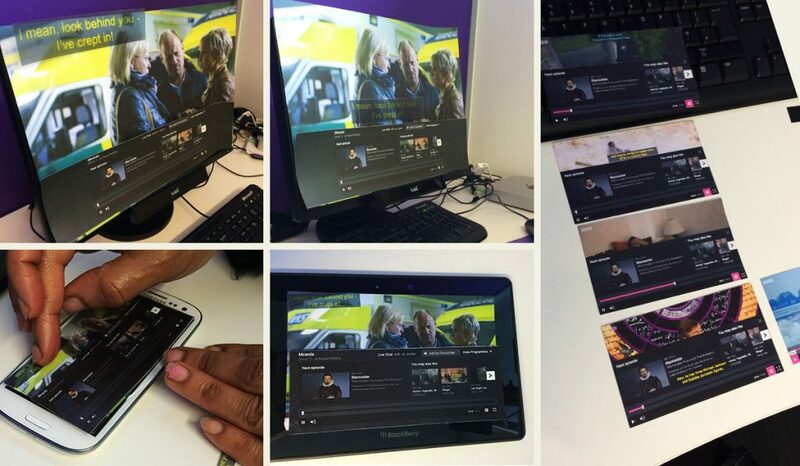 This year the BBC have been gradually introducing the Standard Media Player (SMP), a significant improvement over the previous iPlayer versions, across different areas like the iPlayer, News, Sport and others. In early 2014 we contributed to a small, yet important part of the new BBC player, by conducting research into the use of subtitles. In order to be successful, the BBC wanted to ensure that the standard media player (code behind the iPlayer) was both accessible and usable for all their viewers. Bunnyfoot’s task was to help the BBC team understand the best subtitle size and position across different screen sizes and platforms when the ‘More’ panel was expanded. To achieve this objective we conducted qualitative interviews and observation sessions with 24 participants. This highlights the importance of accurate and timely subtitles, for many different user groups, but for people who are D/deaf and partially deaf, “subtitles are a revelation“. Our research was a small piece of the puzzle within the complex process of providing subtitle services – some of it included in the BBC’s SMP accessibility improvements, with some of it remaining in the teams’ behind-the-scenes work. We want to thank Bunnyfoot for the subtitle research. It was really coherent, has generated a lot of interest and provided teams with the start of some solid research from which to start incrementally improving how we deliver subtitles within our Standard Media Player.